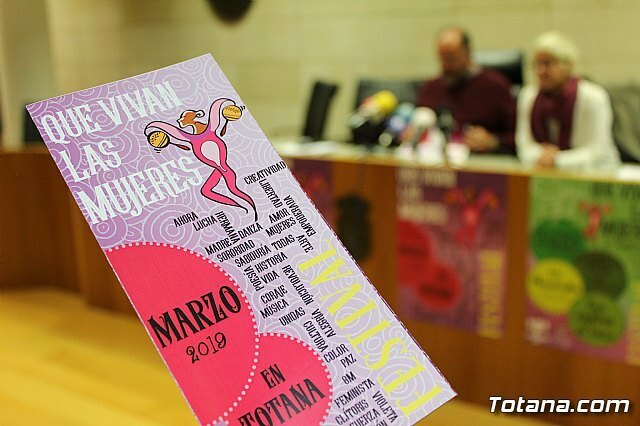 Totana will hold throughout the month of March the Festival "Que vivan las mujeres", a new and ambitious initiative that includes an extensive program of social, musical and cultural activities to commemorate the International Women's Day, celebrated on the 8th March. which are all free except for the Grand Gala that will take place on Friday the 22nd at Cine Velasco (8pm). The first deputy mayor, Juan José Cánovas, and the councilor for Women and Equality, Eulalia Moreno, presented the list of activities that began on March 4 with a colloquium entitled "Education for Equality in the Home and Family Co-responsibility", which Organizes the CAVI (7:30 p.m.), at the offices of the Red Cross. In addition, on Wednesday 6 will be held the Family Concert "Cascaruja Trio" Tribute to Chabuca Granda in the Gran Casino Society (7:00 pm). Thursday 7 will be the Cante Workshop with Carmen María Martínez Salazar and Juan José Robles in the Sociocultural Center "La Cárcel" (6:00 pm) and the act of homage to the people who fought for the achievement of the female vote in the square from the bar "Lola's" (20:00 hours). At 20:30 hours, the talk "Carmen Conde and the Popular University", by J. Francisco Franco, will take place at the Cultural and Worker's Center. 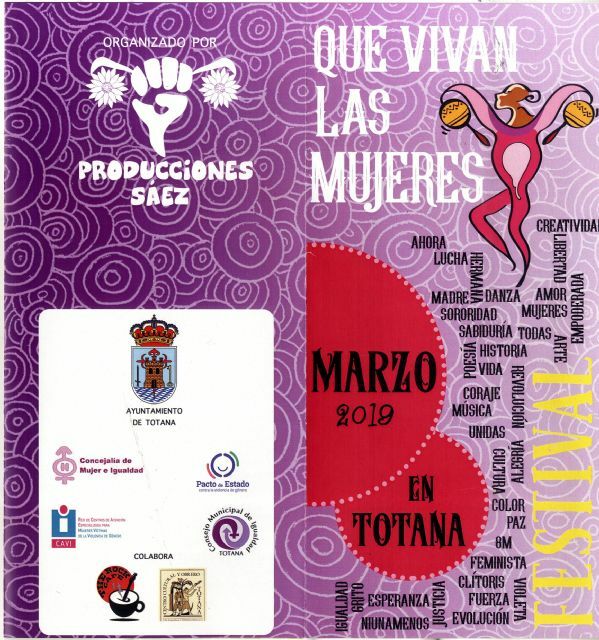 On Friday, March 8, International Women's Day, at 12:00 noon, will be the concentration and reading of the institutional manifesto in the Plaza de la Constitución. 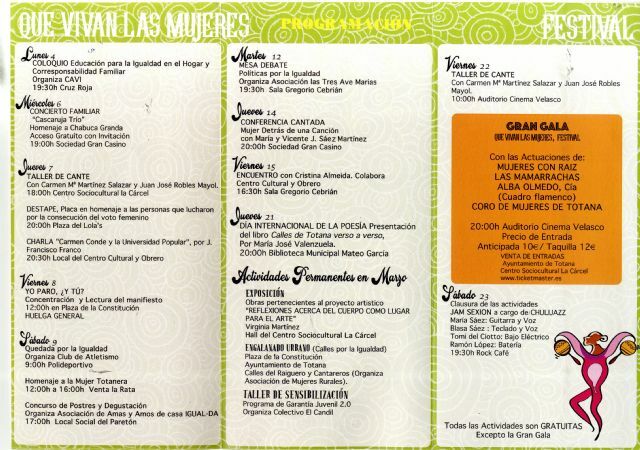 the Tribute to the Totanera Woman in the restaurant "Venta La Rata" (12:00 hours) and the Dessert Competition organized by the Association of Housewives and Housewives "Igual-Da", in the social premises of El Paretón (17 : 00 hours). and on Thursday, the 14th Conference "Woman behind a song", with María and Vicente J. Sáez Martínez, at the Sociedad Gran Casino (8:00 pm). On Friday March 15 will be the meeting with the policy Cristina Almeida, with the collaboration of the Cultural Center and Worker, in the room "Gregorio Cebrián" (4:30 pm) an activity that is yet to be confirmed. The following week, Thursday 21, International Poetry Day, will be the presentation of the book "Streets of Totana verse to verse", María José Valenzuela, in the municipal library "Mateo García" (20:00 hours) and Friday 22 The Cante Workshop will be held with Carmen María Martínez Salazar and Juan José Robles at the Cine Velasco (10:00 am). 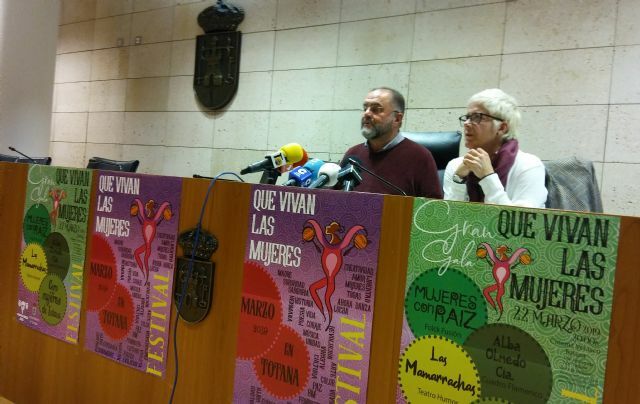 The main event will be the Gran Gala Festival "Que vivan las mujeres", which will take place on Friday, March 22, at 8:00 pm, at the Cine Velasco, with the performances of "Mujeres con raíz", "Las Mamarrachas" , "Alba Olmedo" and "Coro de Mujeres de Totana". The program closes on Saturday the 23rd with the "JAM SEXION" by ChuliJazz at the Rock Café (7:30 pm), which will include María Sáez (guitar and voice), Blasa Sáez (keyboard and voice), Tomi de Ciotto (electric bass) and Ramón López (drums). 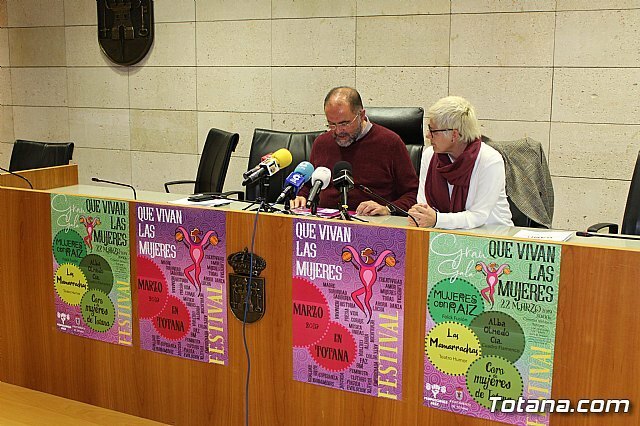 The municipal leaders called for the participation of the program of events, promoted by all groups, to combat the regression in terms of equality and fight with awareness and visibility in favor of the feminist movement.